The Jordan River is the northward-flowing, forty-mile-long waterway connecting Utah Lake on the south with the Great Salt Lake. Returning from California in June 1827, Jedediah Smith crossed the Jordan with some difficulty, noting in his journal that he was "very much strangled" in his attempt. This was probably a reference to the annual spring flooding of what normally is a rather slow-moving river; an occurrence which has been a matter of periodic concern to the area's inhabitants since the founding of Salt Lake City and surrounding communities. 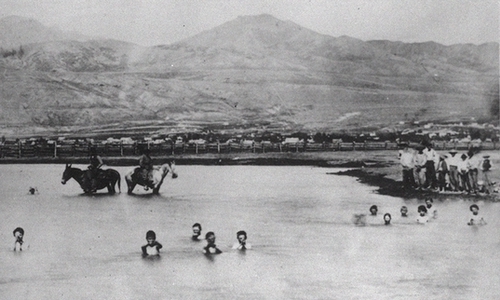 The river was named the "Western Jordan" in 1847 by Heber C. Kimball, soon after his arrival in Utah. He noted its resemblance to the Middle Eastern river of the same name: a river flowing from a "fresh water lake through fertile valleys to a dead sea." "Western" was soon dropped from the river's name. During construction of the Salt Lake Temple, granite blocks were floated down the river to the city. The Jordan was again used to float construction materials in 1869, this time floating logs and ties for use on the Central Utah Railroad. Almost from the beginning of settlement, the communities of Utah and Salt Lake valleys have used the Jordan to carry waste and sewage away to the Great Salt Lake. This created an understandable, albeit occasional, concern for the sanitary and aesthetic qualities of the river. After the river overflowed its banks in 1952, Salt Lake County built a diversion dam and the Army Corps of Engineers enlarged an already extant surplus canal. There followed a program of dredging and straightening the river channel to reduce the damage caused by periodic spring floods. Throughout the 1960s and into the 1970s the Jordan continued to be used as a waste disposal canal for area slaughterhouses, packing plants, mineral reduction mills, and laundries. In 1973 the Utah State Legislature created the Provo-Jordan River Parkway Authority to establish programs to enhance the natural quality of the river and to develop park and recreational facilities, water conservation projects, and flood control measures. By 1976 the Salt Lake Tribune was noting improvements in water quality and decreased industrial pollution, although some areas of the river still needed to be improved. Since the 1980s the Jordan River and its environs have come to be thought of as an urban oasis, offering a variety of recreational activities such as the International Peace Gardens, jogging and equestrian trails, fishing, canoeing, a water slide, a model airplane park, golf courses, and other attractions. See: Atlas of Utah (1981); Richard Poll, ed., Utah's History (1978); Dale L. Morgan, The Great Salt Lake (1986).